Written by Jackie Prell on 24 March 2010 . Master Cho mixes it up with research results, philosophy, and humor at the Feb. 26 - March 4, 2010 workshop in Hilo. What if the best fertilizer was under your feet? What if you could make a product similar to EM and Bokashi simply and cheaply? Well, you can. It’s been happening in South Korea for decades and we have been fortunate to learn the basics here in Hawaii. Four years ago we bought a farm on the Big Island with soil that was flooded for more than seventy years with herbicides, fungicides, and arsenic: the usual arsenal of chemicals used by ginger, sweet potato and sugarcane growers. We were excited to be on land with soil, not just lava rock, common on the Big Island, but were immediately dismayed to see and feel the soil close-up: dry, lifeless powder, not a worm to be found. Our first crops struggled against weeds and pests. Then, a year and a half ago we were introduced to Natural Farming with Indigenous Microorganisms (IMO’s) and we are seeing amazing improvements in our soil structure and plant health. Wherever we put down our homemade, mycorrhizae-rich, “fertility drug” as my husband calls it, the soil regains its loaminess, tilth and structure, and the earthworms come in droves. Natural Farming with IMO’s is a distinctive approach to organic farming that is practiced successfully in over 30 countries, in home gardens and on a commercial scale. Mr. Han Kyu Cho first formulated and fine-tuned these practices for 40 years and has trained over 18,000 people at the Janong Natural Farming Institute (http://janonglove.com ). Then Dr. Hoon Park brought Natural Farming to Hawaii. 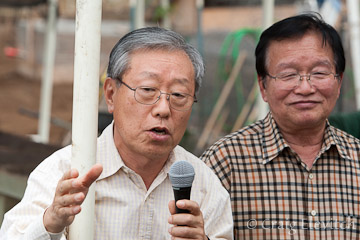 Dr. Park was in South Korea doing missionary work and noticed commercial piggeries with virtually no smell that were using Natural Farming methods. He learned about Natural Farming and realized that this was a practice that could eliminate hunger and poverty in extremely poor parts of the world. He came back to Hawaii, his home, and began giving classes for free. Demonstrations throughout the workshop clearly showed the steps for making potent natural fertilizers. Natural Farming is unique in that it is not meant to be commercialized, but rather practiced by farmers, with cheap, easily available ingredients, and microbes or mycorrhizae indigenous to each locale or farm. These microorganisms are 1) cultured in a simple wooden box of rice, 2) mixed with brown sugar and stored in a crock, 3) further propagated on rice bran or wheat mill run, 4) mixed with soil and cultured again. This is then mixed with 5) compost, or added to potting soil or spread on beds before planting. The entire process takes 3 to 4 weeks. A complete guide to making this input can be found by following a link on our club’s website, http://localgarden.us . Other inputs and sprays are made from fermented plant juices, made from the tips of growing plants mixed with brown sugar. There are also recipes for water soluble calcium made from eggshells, fish amino acid made from fish waste, lactic acid bacteria, and insect attractants made from rice wine. There is also water-soluble calcium phosphate made from animal bones and vinegar and a seed soak solution. There are a half dozen more inputs that can be made simply and easily at home, which are used according to the nutritive/growth cycle of the plants. Many of these inputs are made from things that would otherwise just be thrown away. We get fish waste from the local fish market, which the market would have to pay to dispose of otherwise. The fish amino acids is simply fresh fish waste, de-boned and packed into a container with brown sugar and fermented for a few months. The inputs are made from natural materials, which are not only safe for the environment, but actually invigorate and rehabilitate the ecology. Several University of Hawaii at Hilo Community College professors have been learning Natural Farming and practicing it, as well as going to South Korea to observe it firsthand. David Ikeda, a professor at HCC teaches basic Natural Farming classes and another professor, Michael DuPonte, has helped to establish a piggery in Mountain View using Natural Farming methods and feed. The pigs excrement is so odorless, clean and dry, that you literally don’t even have to clean it out. Methods for raising chickens are similar, with healthier chickens, less work and no smell. Their bedding can remain in place for 10-20 years or just be pulled out when it’s needed for fertilizer. Natural Farming has been embraced by the South Korean government after one county experimented, with every farmer in the county practicing it for a year. These rice farmers not only had bigger yields than usual, but saved money on their inputs and sold their rice for a premium. Where they practiced Natural Farming they had the added benefit of cleaning up the waterways, rivers and even coastal waters. Also in South Korea a co-op of 40 strawberry farmers uses Natural Farming methods exclusively in their 300' long greenhouses producing gorgeous, scrumptious strawberries, which again sell for a premium. And in another wide scale experiment, an entire county is practicing a model of totally self-sufficient farming where each farm has 500 chickens, 20 pigs and five beef cattle. 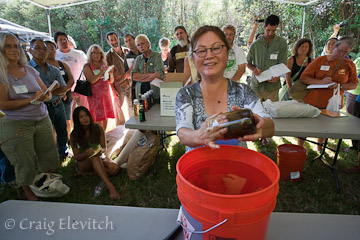 Dr. Hoon Park, who brought Natural Farming to Hawaii, interprets for Master Cho at the 2010 Hilo workshop. Mr. Cho has spread Natural Farming worldwide. He went to the Gobi Desert in Mongolia and planted trees there. Efforts to plant trees had failed three times earlier, under the harsh wind and with only a few inches of rainfall a year. With Natural Farming methods the trees had a 97% survival rate and are now 20' tall. Corn and barnyard grasses have been planted for livestock feed and wells have been dug. Watermelon farming now provides a stable income to farmers there also. When the Chinese were preparing for the Olympics to be held in Beking, China, the Chinese army came in, bringing with them their pigs, which they raise to feed themselves. The population of Beking was suddenly assaulted by the smell of pig waste and protested violently. The head of the Chinese army sent two men to South Korea to study Natural Farming, which he had heard about. The men came back and the army immediately started practicing the Natural Farming methods and the smell went away. The University of Peking now offers Masters and Ph.D programs in Natural Farming. Mr. Cho’s son has created his own methodology of Natural Farming which is even cheaper. His basic recipe for introducing indigenous mycorrhizae to the soil and increasing micro-biological activity on one-quarter acre of land follows. Into 125 gallon container of water, put 5 gallons of ocean water, 6-7 lbs. of sugar, 2 liters of agricultural mineral water (water which has had an aquarium pump circulating the water or has been dropped from 10 feet onto mineral stone or azomite). Now go to a naturally fertile, shaded spot on your land and scoop up a handful of soil off the top half an inch: soil that has it’s own mycorrhizae already present and thriving. Add to this, a handful of soil from three different naturally fertile spots. Mix these soils together and take one handful and drop it into a pint of water. Add to the 125 gallons of water. The last ingredient you make in a blender with wild grasses. Pack a blender with wild grass and a little water and blend. Make 2 quarts of this and add it to the 125 gallons of water/mix. Let this mixture sit for 18 to 20 hours. To apply it directly onto the soil, dilute it 10 times. To foliar feed, dilute it 20 times. Apply it during rain or right before rain or in the evening or early morning. This solution can be applied 8 to 10 times a year for the best results. Very simply, Natural Farming is the propagation of mycorrhizae, along with protocols for adding specific inputs during the nutritive cycle of the plant. Mycorrhizae are “fungus roots” and act as an interface between plants and soil. They grow into the roots of crops and out into the soil, increasing the root system many thousands of times over. They act symbiotically, converting with enzymes the nutrients of the soil into food the plants can use and taking carbohydrates from the plants and turning it into nutrients the soil can use: “sequestering” carbon in the soil for later use. Miles of fungal filaments can be present in an ounce of healthy soil. Mycorrhizal inoculation of soil increases the accumulation of carbon in the soil by depositing glomalin, which in turn, increases soil structure, by binding organic matter to mineral particles in the soil. It is glomalin that gives soil its tilth, its texture and rich feel, its buoyancy and ability to hold water. Can Natural Farming be done with no store-bought fertilizers? It is being done not only in home gardens but also on a commercial scale. For us, here in Hawai‘i, it is incredibly empowering to mix our own mycorrhizae-rich soil amendments and to be weaned from the fertilizer store. It is simple, cheap and easy to try. Follow the steps at the http://localgarden.us website and make your own. Plant a tray of seedlings with it, and next to it a tray of seedlings without it. You’ll be impressed by the difference.